What do Cokie Roberts and Doris Kearns Goodwin have in common? They both came to the Finger Lakes—compliments of the Seward House Museum Distinguished Speaker Series. Of course, the Finger Lakes region has always had a lot to offer locals and tourists, but these renowned women have global appeal. Roberts is a contributing senior news analyst for NPR and a regular roundtable analyst for "This Week With George Stephanopoulos." She also works as a political commentator for ABC News and writes a weekly column. Doris Kearns Goodwin spoke last fall as part of the 2012 Elsa Soderberg Distinguished Speaker Series. Goodwin spoke about William H. Seward, his importance with helping to shape a nation, and about her award winning book, "Team of Rivals." Our small city of Auburn, NY was built around William Seward’s significant contributions to the United States of America. Please add the Seward House Museum to your vacation and educational opportunities. What a wealth of history. Yes we know that the Finger Lakes region is rich with beautiful lakes, descriptive vineyards, fertile farmland, and gorges with waterfalls. But we may be equally proud of the history of our lands. 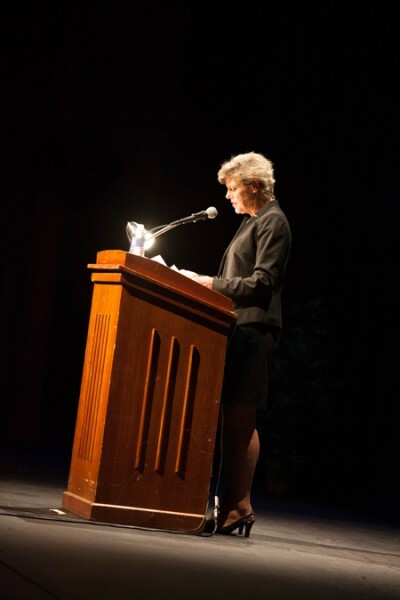 Last night Cokie Roberts’ lecture at Auburn High School was wonderful. What a dynamic, intelligent, woman. Cokie Roberts spoke about our need for compromise in our country. She is able to get an aerial view of the political picture and she understands the significance of history which is often repeated. Roberts challenges us to look at more points of view rather than just like minds. How fortunate we really are in this beautiful Finger Lakes region which is rich in history and fertile for new perspectives. If you are interested in Candlelight Tours of The Beautiful Seward House there are three weekends in December when you can enjoy wonderful memories and traditions: Dec. 6 & 7, Dec. 13 & 14, Dec. 20 & 21.